BRASILIA, April 27, 2018 - The Chilean President Sebastián Piñera and Brazilian President Michel discussed a proposal for a free trade agreement between Brazil and Chile. 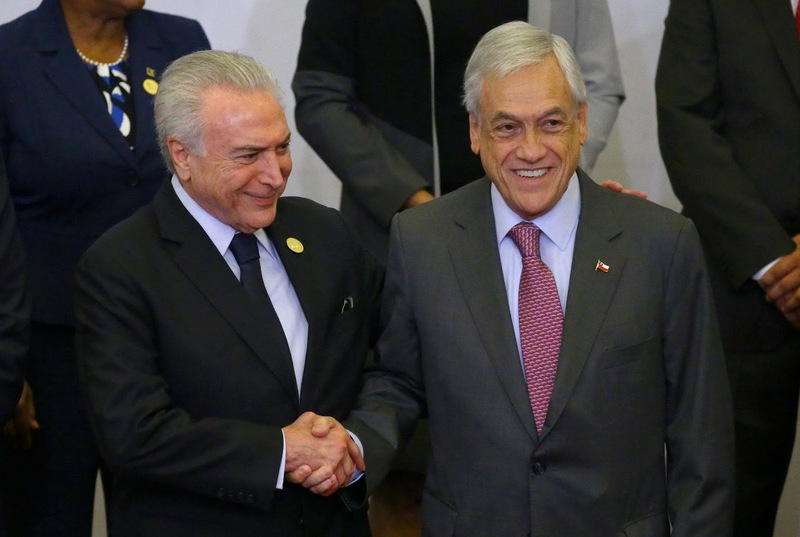 Temer described the agreement as "ambitious" and said that Piñera’s visit has led to strides in the economic arena. "We’ve accepted the proposal of President Piñera to negotiate a new and ambitious free commerce agreement. This is no longer a matter of eliminating tariff barriers—we’ve reached a new level. Now, our goal is to overcome regulatory barriers on the Brazil-Chile exchange," Temer said, adding that the two also discussed ways to further promote integration between Mercosur and the Pacific Alliance, as well as the physical integration of South America. Piñera said that, ever since Chile became an independent nation, the country has enjoyed privileged relations with Brazil, with no physical or commercial borders between the two countries. Though short, Temer’s visit proved fruitful, he said, with the beginning of talks to forge a free trade deal between Brazil and Chile. "Something we’ve always wished, and now is about to materialize," Piñera said. The Chilean president mentioned the bulk of Chilean investments in Brazil, which currently totals upwards of $30 billion, and reiterated the country’s efforts to expand the partnership in the fight against cybercrime and drug trafficking. According to Brazil's Foreign Ministry, Brazil’s trade with Chile reached the nearly U.S. $8.5 billion in 2017, an increase of about 22 percent year on year. Piñera was elected to a second presidential term in March 2018. His first term was between 2010 and 2014. NOTE: The Economic Complementation Agreement between Chile and MERCOSUR (which is comprised of Argentina, Brazil, Paraguay, and Uruguay) was signed on June 25, 1996, in Potrero de los Funes, Argentina. The Agreement was elaborated within the ALADI framework as a Partial Scope Economic Complementation Agreement No. 35 (ACE 35). The current situation facing Venezuela was also brought to the debate. Temer said that "the country’s political fate of the country" has both nations concerned. "We’re worried about the Venezuelan people; so we agree that there is no alternative for our region other than an openly democratic regime." In his address, the Brazilian president thanked Piñera for having chosen Brazil as one of the destinations on the first official trip of his second term of office as president. Before coming to Brazil, he visited Argentina.